This help topic describes the basic properties used to configure the way RadRadialMenu looks & behaves. Initially RadRadialMenu is closed, you should click on the RadialMenuButton in order to open it and show its items. IsOpen boolean property of the RadialMenu allows you to make it open by default. Example 1 shows how IsOpen can be set. The size of RadRadialMenu is set through MinWidth and MinHeight properties. 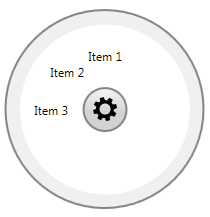 Both should be set to the same value which refers to the diameter of the circle representing the menu. Figure 1 shows how the RadialMenu looks in smaller size. StartAngle property is used to set the angle at which the first RadRadialMenuItem will be positioned. Figure 2 shows how the RadialMenu looks with different settings of the StartAngle property. InnerRadiusFactor - defines the inner radius of the panel holding all RadRadialMenuItems as a fraction of the size of RadRadialMenu control. The value should be between 0 and 1. If the passed value lies outside this range, it is automatically set to the nearest boundary value. 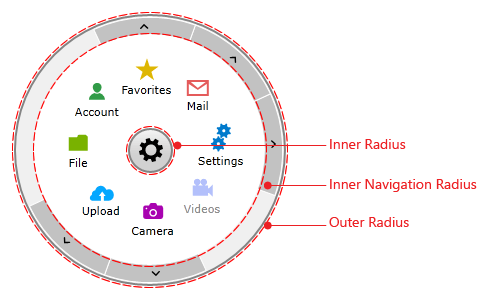 InnerNavigationRadiusFactor - defines the inner radius of the panel holding the NavigationItemButton items as a fraction of the size of RadRadialMenu control. The value should be between 0 and 1. If the passed value lies outside this range, it is automatically set to the nearest boundary value. OuterRadiusFactor - defines the outer radius of the panel holding the NavigationItemButton items as a fraction of the size of RadRadialMenu control. The value should be between 0 and 1. If the passed value lies outside this range, it is automatically set to the nearest boundary value.